I’m back in Seattle after an inspiring 11 days out with “Girls on Ice,” a program free to select high school girls to learn about glaciology, mountaineering, and (this year!) art. My co-instructors were Erin Pettit who first began the program while a graduate student at the University of Washington and Cecelia Mortenson, a mountaineer who’s worked around the world including as field safety with the US Antarctic program. Along with the wonderful nine participants from around the US, we made a great team. Thank you to everyone for your support, energy, inspiration, and the contributions which made this all possible. I’m still catching up from the trip (with gear left to scrub and emails to reply to…) but will recap a few highlights. We spent a total of eight days on the Mt. Baker, camped on the snow above 6,000 ft and just to the east of the Easton Glacier. Our first five days were rainy and grey, which included a thunderstorm (on our first night!) The girls quickly discovered that Gore-Tex is not truly waterproof and learned to stay warm with singing and dancing. 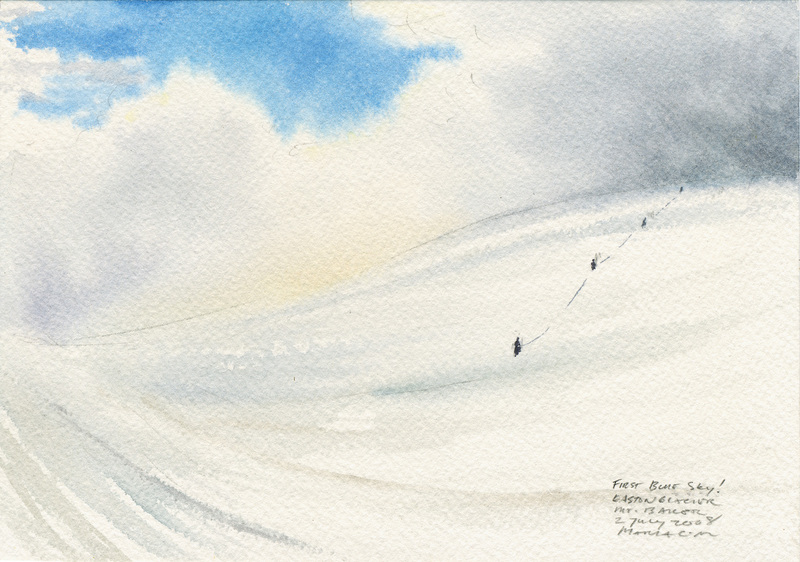 Throughout the inclement weather, spirits remained high and we learned about snow travel, basic glacier mountaineering, glacier dynamics, and tools for observation. We also had three projects including studying ice worms, mass balance of the Easton glacier, and a time-lapse photography setup. When the sun finally came out, the whole team climbed to Mt. Baker’s crater where sulphuric gases were buffeting out and half our team continued on to the summit. We spent our last two nights at the North Cascades Institute’s Learning Center on Lake Diablo (a stunning place that is well worth a visit!) to decompress, work on projects, and clean up. Everything was all in all a great success! My favorite analogy for the rain and whiteout conditions we endured was a “snow globe.” One of the gals observed after “sucker holes” came and went (patches of blue sky) that every time we grew hopeful about a change, it seemed as though someone turned us upside down, shook us ’round, and left us in even worse conditions- and all the more loopy. 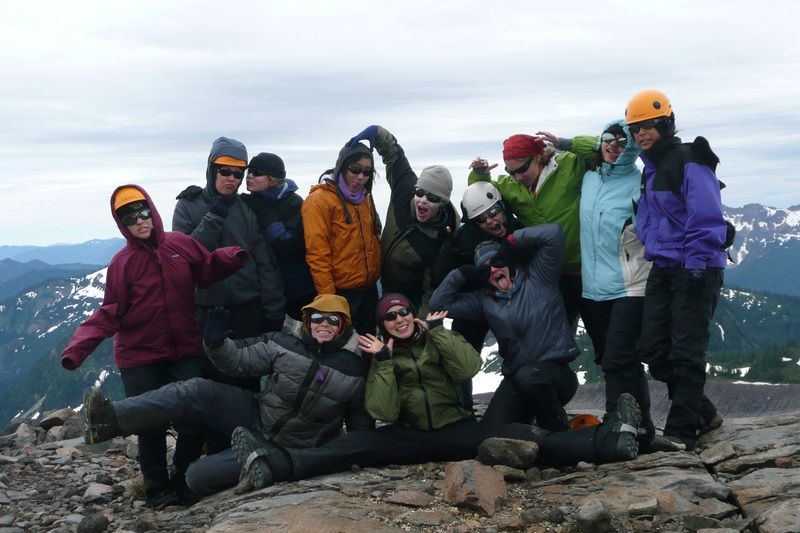 Giggles were contagious after we learned to dance “Soulja Boy” while wearing crampons on ice. I’ve posted our time-lapse photography video here if you’d like to check it out. We sought to observe ablation and glacier movement (we placed rocks on the ice for markers), but learned that not everything turns out as expected. We unfortunately ran out of battery power right after the weather improved… Many notes were made for next year! Check back soon for more stories and sketches. Thanks for the update! It’s great to hear your perspective on the trip. We heard that your art instruction was a wonderful addition to the experience. One person even said that you had “art spewing from every pore”. I’d like to see that! Exploring the Wild Pacific Coast trail and Ucluelet Aquarium. Exploring rocky and windswept coastlines on Vancouver Island.